Henry de Lacy (1) was probably the third son of Robert de Lacy (1). He inherited the de Lacy lands after his brother Ilbert died without an heir. It seems that Henry de Lacy continued to support King Stephen but he received pardons when Henry II (the son of Matilda) came to the throne. One of these pardons was witnessed by the Empress Matilda and it restored his father’s lands to him and pardoned him for anything he had done before he paid homage to Henry II. Henry built a timber castle at Selby around 1143 probably to protect not only his own estates on their weakest side but the town and abbey of Selby as well. The abbot at the time, Elias Paynel, was a relative of the de Lacy family and the de Lacy estates came with two miles of Selby. Selby castle was besieged within a week of its commencement by an Earl William who was at war with Henry. He may have been William of Roumare (earl of Lincoln) or William of Aumale (earl of York) or William earl of Warenne (holder of Conisbrough, Wakefield and Dewsbury). All three were neighbours to Henry de Lacy and whichever one it was may have been fighting in league with Guy de Laval who had a claim on the honour of Pontefract because the lands had previously been given to his family during the exile of the de Lacy family. The town of Selby was sacked and burned and even though the castle held out for a few days longer it was surrendered. Henry also built castles at Almondbury and Barwick with permission from King Stephen, creating a good ring of protection around the honour which was necessary as he was also troubled by a private war with Gilbert de Gaunt (who became earl of Lincoln and was the brother of Ilbert’s wife Alice). When Henry de Lacy fell ill he vowed that if he recovered he would found a religious house. 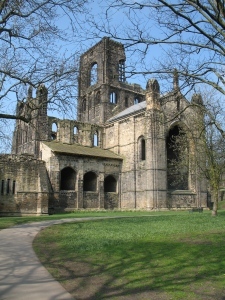 When he was well again he gave land at Barnoldswick to the mother house of the Cistercian order at Fountains Abbey for them to establish a daughter house there, but the site proved unsuitable and on 19th May 1152 the monks moved to a new site at Kirkstall. The land belonged to William Peitevin, who held it of Henry de Lacy, but it is Henry who is recorded in the foundation history as being the driving force behind William’s grant of this land to the monks. Henry de Lacy went on crusade to the Holy Land on two separate occasions. The first time was around 1158. He was exempted from taxation that year, but was back in England for the dedication of the new church at Pontefract priory in 1159. In 1165 he was with the king on his Welsh expedition and took along a large retinue. He was also with the king in Normandy in 1173. At Easter 1177 he left for Jerusalem for a second time in the company of the earl of Essex and the count of Flanders and at this time he also witnessed the award made by Henry II between Alphonso, king of Castile, and Sancho, king of Navarre. Henry de Lacy died on crusade on 25th September 1177, but how and where is not known. Whether his remains were brought back for burial at Kirkstall abbey is unclear. Henry was married to the sister of William de Vesci, lord of Alnwick. They had one known son named Robert de Lacy (2) who inherited the lands.